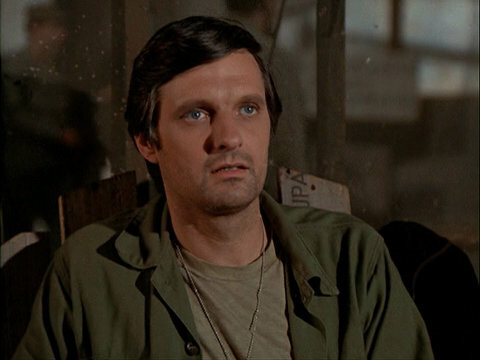 Capsule Summary: Hawkeye writes another letter to his father, telling him about the latest goings-on at the 4077th. The third and last Dear Dad episode, “Dear Dad… Three” is also the weakest, in my opinion. Not a lot of laughs. Like all the letter home episodes, there’s no story, just vignettes. Perhaps the most significant is the tale Hawkeye tells his father about the racist Sergeant Condon. Hawkeye is so disturbed when Condon worries he’ll be given the wrong color blood, he decides teach the man a lesson. Hawkeye and Trapper tint Condon’s skin and enlist the help of Ginger and Klinger to trick him into thinking he did get the wrong color blood. The two later tell Condon about Dr. Charles Drew, who helped pioneer blood storage and transfusion techniques. An African-American, Dr. Drew died in April 1950 following a car accident but not because a hospital refused to treat him. 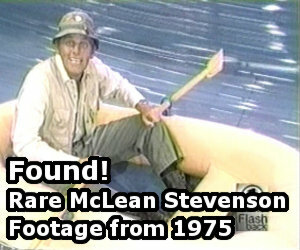 It’s unfortunate M*A*S*H has played a role in keeping this particular urban legend alive. Henry’s home movies are interesting to watch but not nearly as amusing as Frank’s home movies, seen in “There’s Nothing Like A Nurse” during Season 3. The staff meeting is just boring, to be honest. I do like how Frank is vehemently opposed to voting to end the war. Radar almost seems to think the vote actually means something. For some reason, Trapper climbing onto the table after the vote (perhaps eager to get to the unemployment office?”) is hilarious to me. A few minor things: the soldier with a grenade stuck in his body; the camp happy hour at in the Mess Tent; Father Mulcahy boxing to keep in shape; Frank and Margaret slapping one another and then furiously kissing; Hawkeye meeting Anna Lindstrom. In a March 2001 post to the alt.tv.mash Usenet group, Larry Gelbart revealed he went to high school with Kathleen Hughes, who plays Lorraine Blake in Henry’s home movies. Hawkeye mentions hearing about General Eisenhower running for President. Eisenhower made the announcement in January 1952. Therefore, this episode must take place around that time. That conflicts with Hawkeye telling Sgt. Condon that Dr. Charles Drew “died last April” because Dr. Drew died in April 1950. The group playing volleyball in the opening scene includes Kellye Nakahara, Sheila Lauritsen, Marcia Gelman, and Dennis Troy. During the late 1990s and early 2000s, I recall cable channel FX using footage from this episode–specifically, Frank and Margaret passionately kissing, in promotional spots for M*A*S*H.
I don’t really have much to say about this episode that hasn’t already been said. While I don’t necessarily agree that it’s a boring episode, I will agree that of the three “Dear Dad” episodes, it is probably the weakest. I believe that Mills Watson, who plays Condon in this episode, bears a resemblance to Dennis Franz, of “NYPD Blue” fame. Watson also starred on the short-lived series “Lobo”. Other than that, this was a run of the mill episode. I watched this just yesterday – the grenade shot in a solider was powerful. I burst out laughing when they other guy thought he was turning black. Just found this site, have seen each episode just about twice, and currently enjoying going through again, at random. Thanks for the effort put in to run this site! I love this website. I come here every time I have a question about a M*A*S*H episode. I wish you’d do this for every show that I watch. Not necessarily. Remember that Hawkeye is writing home about his memories of things that have happened. Our memories are not linear. If he’s writing in 1952, that doesn’t mean that the memory of the prejudiced soldier wasn’t from 1950. Hawkeye doesn’t write that everything happened in the last week, the last month or the last letter only that it happened since he arrived in Korea.